Someone who explores the internet (or "cyberspace"), and who is normally searching for information: An internaut is an "internet sailor" or a "sailor on the internet". 1. Descriptive of denouncements which damage or injure participants on both sides of a conflict or contention: The presidential candidates have been hurling internecine accusations at each other. 2. Characterized by bloodshed or carnage: In Syria, there has been a brutal internecine war going on that has harmed millions of people. 3. Concerning a dispute that can tear an organization apart: The political party has been suffering because of bitter internecine disagreements. 4. Etymology: "deadly, destructive," from Latin internecinus, "very deadly, murderous, destructive"; from internecare, "to kill or to destroy"; from inter-, "among, between" + necare, "to kill". 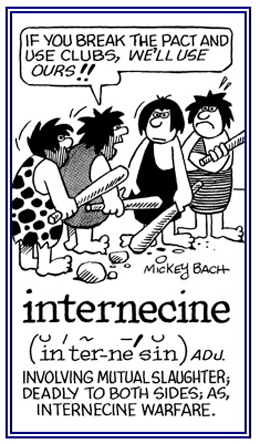 The original meaning of internecine is "attended by great slaughter". 1. The part of a plant stem between two nodes. 2. A section or part between two nodes; such as, a nerve or stem. 1. Located or occurring between nuclei. 2. Pertaining to or affecting structures between nuclei, as internuclear ophthalmoplegia. 3. Between the nuclear layers of the retina. 1. Being, or situated, between the eyes. 2. Between, or within, the eyes; such as, the interocular distance. 3. Situated between the eyes; such as, the antennae of some insects. 1. Mutually touching or intersecting; as, interosculant circles. 2. Uniting two groups; said of certain genera which connect family groups, or of species that connect genera. 1. To kiss together, to touch. 2. To have the character of, or to lie between, two distinct groups. 3. To form a connecting link, as between objects, genera, etc. 4. Etymology: from Latin osculat-, "kissed"; from the verb osculari, from osculum, "little mouth" or "kiss". Showing page 12 out of 18 pages of 260 main-word entries or main-word-entry groups.